Let’s say, just for fun, that you were a flight attendant. One of your jobs is to check the number of passengers vs. what’s on the flight manifest. Too few and you would chalk it up to someone missing their flight. Oh well. But what if there were too many passengers? You would figure there’s a problem. The same might go for a cruise ship, like the Love Boat. Maybe Gopher, the ship’s purser, found a discrepancy. He discovered there was a stowaway – or maybe several more on board than the ship’s manifest indicated. Naturally you would think he would alert the authorities. Stowing away is illegal. You know what else is illegal? Falsely registering to vote. But this, according to the left, simply isn’t happening. It was just another hyperbolic claim from our unhinged President. I’m not a big Trump defender, but I will when I think he’s right, or is at least on to something. Well, to this day, he ridiculed whenever he brings up massive voter cost him the popular vote. I’m beginning to think he may have been right. Nearly one dozen California counties had more registered voters on their voter rolls than people eligible to vote living in their county, a new Judicial Watch letter has revealed. The conservative watchdog group sent a letter to California Secretary of State Alex Padilla on August 1 on behalf of the Election Integrity Project of California. The letter threatened to sue the Golden State if they refuse to comply with the National Voter Registration Act, which mandates voting precincts maintain the integrity of their voter rolls by taking steps to maintain their accuracy. Judicial Watch went on to report that officials from Los Angeles County since told the watchdog group in June that the “total number of registered voters now stands at a number that is a whopping 144% of the total number of resident citizens of voting age” for that county. “California’s voting rolls are an absolute mess that undermines the very idea of clean elections. It is urgent that California take reasonable steps to clean up its rolls,” Judicial Watch president Tom Fitton said in a statement. The following video is from Conservative Review. It shows the chairwoman of the Nebraska State Democrat Party speaking about welcoming immigrant and refugees into her State. She is proud that on a per capita basis, Nebraska welcomes the greatest amount of immigrants and refugees. I’m sure the people of the red State of Nebraska would be thrilled by this news. The video shows her walking to and displaying several of what she calls welcome baskets for incoming refugees. There are the usual items, including blankets, pillows, toilet paper and such. And then on top of each basket, is an envelope she says is from the Nebraska State Democrat Party. Inside the envelope is a letter welcoming the new welfare recipients (my words – not hers), and one other thing – a VOTER REGISTRATION CARD!! Yes – a voter registration card, which is clearly illegal, but described by her in passing as harmlessly as reciting a shopping list. The entire short video is a must see, but the shocker is at 2:36 in. 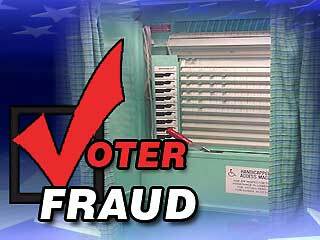 What’s the democrat refrain – there is no voter fraud? Theft: As “calibration errors” switch votes in Illinois and Maryland, an election watchdog group sues the latter over massive voting by noncitizens in one county after discovering voters registered in multiple states. With the midterms less than a week away, we are being bombarded with campaign ads. The radio, TV, Internet – they’re everywhere. We are also being deluged with stories of campaign fraud. Yesterday I wrote of Colorado’s new all mail balloting and the potential for massive fraud in that state. But in fact the fraud doesn’t need to be widespread or massive for Democrat hacks to claim victory. The Wall Street Journal reported that, “In 2014, 16 local races in Ohio were decided by one vote or through breaking a tie. In 2013, 35 local races in Ohio were that close,” and the Obama rubberstamp, Al Franken, won his Senate seat by 312 votes. Many local, state and even national races are often decided by 500 votes were less. Various types of Democrat fraud could more than tip the scales. The hysteria has begun, although it never really subsided. Like the IOC (International Olympic Committee), president declaring the Olympic Games open, so too has our beloved leader officially declared, in this election-year, the protection of voter fraud has begun. Yes, Barack Milhouse Obama has kicked off the commencement of the seven-month full-court press to protect our “precious” right to vote and the closer we get to the upcoming midterms in November, the more ridiculous the rhetoric will become. As an aside, some may wonder about the “Milhouse” thing. Mark Levin started it years ago, when people would complain about the use of Obama’s real middle name, Hussein. So Levin simply took Nixon’s and inserted it. Tagged Al Sharpton • early voting • mid term elections • Obama • Voter Fraud • Voter I.D. New video from Project Veritas shows an Obama for America campaign staffer providing advice and a ballot to an undercover reporter posing as an Obama activist about how to vote twice in the upcoming presidential election. The activist tells Obama for America Houston Director Stephanie Caballero, who is a salaried employee of the Democratic National Committee, she wants to vote in Texas and in Florida. Former DOJ Attorney Christian Adams explains the legality of the situation. Obama campaign attorney Robert Bauer should be emailing memos to every paid staffer detailing 42 USC 1973i(e) and 42 USC § 1973gg–10(2). 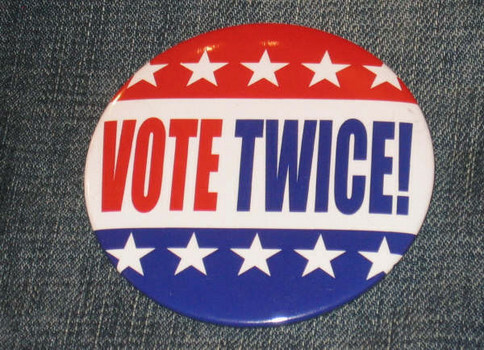 The former federal law makes it illegal to vote twice. The latter law prohibits fraudulent voting in a federal election. 18 USC 2 makes it illegal to aid and abet election fraud. Encouraging voter participation of marginal legality is nothing new for the Obama campaign. In 2008, they had an elaborate web portal for college students, encouraging some to register to vote where they went to school, discouraging others. The overall goal was to get students attending college in battleground states registered to vote in those states regardless of their actual domicile. If a student from a battleground state went to college in a safe red or blue state, they were encouraged to keep their registration in their home battleground state. The Obama campaign website in 2008 never told the students to cancel their original voter registration. Nor did it provide guidelines for what constituted bona fide domicile. Currently, voter watchdog groups like True the Vote are conducting data crunching to determine who may have violated federal election law in 2008 by voting in two states for President. If someone does it again in 2012, it will eventually be caught thanks to the efforts of private parties combing voter rolls. The Obama for America will spin this story by throwing Caballero under the bus and will say she is an inexperienced staffer. The problem is, Caballero is the director of the Obama for America Houston office pulling a salary. Caballero isn’t an inexperienced staffer or volunteer, not to mention, Caballero’s response to the questions about voting twice should have been, “You can’t do that and it’s illegal.” Instead, Caballero giggled and encouraged double voting in Texas and the swing state of Florida. UPDATE: Watchdog.org has more information about the violation of statutes. Federally, 42 USC § 1973gg is the strongest as it penalizes attempts to deprive residents of a fair election through false voter registration forms. 42 USC 1973i(c) is your other strong bet. There are more (li ke the antiquated 18 USC 597), but these 1973gg and 1973i(c) are your strongest federal options. Remember, policing election integrity occurs first at the state level, then goes up to the federal level. Under Texas law, pay attention to Section 273.001 of the Texas Election Code. It provides that if two or more registered voters present affidavits alleging criminal conduct in connection with the election to the county prosecutor, he shall investigate the matter. If the conduct concerns activities beyond one county, the state attorney general may be properly involved.